CHARLES DESMOND Greaves, internationalist, champion of Irish unity and independence, revolutionary socialist and Marxist historian, was born at 7A, Rockville Street, Rock Ferry, Birkenhead – across the Mersey from Liverpool – on 27 September, l9l3. His family was of middle-class, Protestant, Irish and Welsh background. They used go on summer holidays each year to Newcastle, Co.Down, when Greaves and his sister were children. He grew up in a stimulating social environment. At that time Liverpool was still not far from its Victorian zenith when it had been the greatest port in the world; while a cycle-ride of a few miles across the Wirrall through Chester brought one into the hills of Clwyd, where people still spoke their native Welsh. His father, Charles Edward Greaves, was a post office official, a man of strong musical interests, who conducted the Liverpool Post Office orchestra and ran the local Methodist Church choir. His mother, born Amy Elizabeth Taylor, had a degree in music. Greaves used say he knew more about music than any other subject. He attended Birkenhead Institute grammar school, which he later termed “a cram shop”; but it stimulated an interest in science, in particular botany. He joined the Liverpool Botanical Society and had his first scientific paper, written at the age of l8, published in the North-Western Naturalist. He attended Liverpool University from l932 to l936, graduating in botany, chemistry and geography. He began to write poetry in his teens and continued doing so throughout his life. Some of his early pieces were carried in the Poetry Review during the l930s. He became interested in aesthetic theory, on which he later filled several notebooks, and was planning a book on scientific aesthetics at the time of his death. In the politically dramatic decade of the l930s, with fascism advancing on the continent, some of the best of Britain’s young intelligentsia moved to the left. At university Greaves became involved in the student Socialist Society and in l934 joined the Communist Party of Great Britain, which he remained a member of throughout his life. He took to politics like a duck to water, he used say. In the l930s, he later recalled, he had three regular set speeches: on the horrors of war, the crimes of the British Empire and the evils of partition! He used sell the paper Republican Congress in the Irish districts of Liverpool. From the time of his political awakening, perhaps because of his Irish and Welsh family background, he was interested above all in the national question and issues of colonialism and imperialism. He early reached the conclusion that socialist internationalism can be based only on the free cooperation of sovereign, independent nation states. This conviction was strengthened when he went to London in l937 by friendships he formed with leading figures of the British communist movement. Most notable of these was Thomas Alfred Jackson (1), the English Marxist historian of Ireland, to whose general history of the country, Ireland Her Own, Greaves later added a modern epilogue. Jackson had known James Connolly personally and in later life Greaves, who had a strong sense of the importance of the personal transmission of tradition, used say that he regarded himself as having passed on to a new generation the socialist republicanism of Connolly which he had originally got from Jackson. Others he came to know at that time were Rajani Palme Dutt (2), Willie Gallacher MP (3) and Jimmy Shields (4). These in their various ways upheld the classic view of Marx and Engels that complete British disengagement from Ireland was in the interest of the British working class and the advance of the labour movement and socialist cause in Britain – a view which Greaves championed throughout his political life. FROM THE late l930s until l95l Greaves worked in the chemical industry, during which time he added several scientific patents to his name. He was employed at Woolwich Arsenal during World War II. Later he worked with the British Coal Utilisation Board and Powell Duffryns, where he became chief research chemist. His political activity during this time became oriented largely towards Ireland and the Connolly Association. In l94l he joined the Connolly Club, as it was then known. This had been founded in September l938 as a coming-together of the London branch of the Republican Congress, the Irish section of the League Against Imperialism and some people who were former members of the Irish Self-Determination League, which had supported Sinn Féin in Britain during the War of Independence. Its orientation was republican labour. During World War II it sought to organise the Irish people who were streaming into Britain’s war-time industries by urging them to join trade unions and bring their influence to bear on the politics of the country they had moved to. At the same time it defended Ireland’s right to stay neutral in the war. Greaves became secretary of its Exiles Advisory Bureau, dealing with countless queries about lodgings, jobs and call-up matters among the immigrants. The Connolly Association was slow to adapt to post-war circumstances and the advent of the Cold War. For a time it adopted a far-left course, partly under the influence of the editor of its monthly paper, Pat Dooley, who was strongly anti-clerical (5). The sales of Irish Freedom – which became the Irish Democrat in l945 – had been high during the war when no Irish papers were imported. They now fell drastically. In January l948 the paper was on the point of closing when Greaves agreed to take on the editorship. He gradually turned its fortunes around. He remained editor for the 40 years until his death, by which time the Irish Democrat could claim to be the longest established Irish working class paper in existence. In l95l he gave up his well-paid position with Powell Duffryn to go full-time as editor. Henceforth his political life inextricably merged with the story of the Connolly Association. Greaves’s decision to devote himself full-time to politics constituted the mature second choice which, he used say, all revolutionaries had to make if they were to sustain throughout their lives the commitment first entered on in the idealism of youth. For Greaves that commitment was to the cause of a united independent Ireland, to be achieved by making the ending of partition the policy of the British labour movement. He held that the near million-strong Irish community in Britain, if organised, could be a powerful influence on British politics, to their own benefit and that of the country they had come from. Over the next four decades he sought to make the Connolly Association and its monthly paper the means of achieving that organisation. In the process he became known throughout the Irish community in Britain and the wider labour movement as an indefatigable organiser, public speaker, lecturer and writer who influenced significantly large numbers of those he came in contact with, particularly perhaps young people. The material rewards were few. His wage as editor was always of the most modest – in the l950s close to penury. Greaves was an editor who, like James Connolly before him, at once edited his paper, supervised its lay-out and then sold it personally to the readers (6). He not only wrote much of it, but went regularly to the printers in the little market town of Ripley, Derbyshire, for four decades to read the monthly proofs and then hawked it weekend after weekend around the pubs of the Irish districts or outside churches and Irish dance-halls, together with other members of the Association. He continued to do this regularly into his sixties. He had an excellent rapport with the immigrant Irish workers, enjoyed “the craic” and was able to swap repartee with the best. Some of them must occasionally have wondered, though, how such a gifted and obviously highly educated man had come to devote himself to this political work among them, in a social and political climate that was often of the bleakest. In the l950s, as the guiding political brain of the Connolly Association, Greaves advanced the view that the way to a peaceful solution of the Irish problem was to discredit Ulster unionism in Britain through exposing the discriminatory practices which occurred under the Stormont regime in Belfast, in the process winning sympathetic allies for the cause of Irish reunification in the country that had legislated partition into existence. This perspective was embodied in a new constitution he drafted for the Connolly Association, which it adopted at its December l955 annual conference in Birmingham. There followed a fifteen-year-long campaign of education and propaganda, directed mainly at the labour and trade union movement, which did much to ensure that when, in l968, the civil rights agitation got going in the north itself, British labour opinion was substantially behind the nationalist rather than unionist side. This was a transformation from l949, when the Labour government had passed the Ireland Act which purported to give the Stormont parliament a veto on constitutional change affecting the north. In l958 Greaves proposed that the Association send the English lawyer, John Hostettler, to cover the trial of the republican activists Mallon and Talbot in Belfast. Subsequently, in a series of meetings throughout England, Hostettler spoke on the abuses of the RUC that were exposed during this trial and the iniquities of the Special Powers Act. Following the formal cessation in 1961 of the IRA’s Border campaign of the late 50s, Greaves and the Connolly Association took up the issue of the release of the republican internees in Crumlin Road prison, Belfast. Numbers of these were trade unionists, some of them members of British unions whose branches and members found it hard to believe that people could be interned without charge or trial, sometimes for years on end, in part of the United Kingdom, even though the matter could not be raised at Westminster under the “convention” whereby British MPs were forbidden to raise subjects devolved to Stormont under the Government of Ireland Act. This was a happy way of ensuring that various sleeping political dogs, which might otherwise inconvenience the British government, were left undisturbed. Through a succession of lobbies at Westminster, Greaves and the Association succeeded in getting over half the Parliamentary Labour Party, together with various British notabilities, to send telegrams to northern Unionist prime minister Brookeborough demanding the release of the internees, which gradually occurred. This campaign enabled Greaves to build good relations with the old Nationalist Party and in particular with the late Cahir Healy, Member for Fermanagh in the Stormont parliament, with whom he stayed in l962 while on an investigative visit to study anti-Catholic discrimination in the six counties. The Association organised other visits to the north by British notabilities, among them Col. Marcus Lipton, Labour MP for Brixton, Miss Betty Harrison of the Tobacco Workers Union and John Eber, secretary of the Movement for Colonial Freedom – later Liberation – which championed the anti-colonialist cause in the latter decades of the British Empire’s existence. There followed a series of civil rights marches across England -the longest being one from Liverpool to London in l962 – which Greaves both organised and participated in, with a couple of dozen Irish people holding meetings in the towns along the way and describing the injustices suffered by the Northern Catholics. Strictly speaking, these were the first Irish civil rights marches, although they took place in England and were greeted with derision and indifference rather than brickbats. The anti-unionist campaign was taken up by the National Council for Civil Liberties and the Movement for Colonial Freedom, to which the Connolly Association was affiliated and, from l965, by the Labour Party based Campaign for Democracy in Ulster, with Connolly Association encouragement. In l966 Brookeborough’s successor as Northern Ireland prime minister, Captain Terence O’Neill, was sufficiently alarmed at the growth of anti-unionist sentiment at Westminster to write a letter to the Connolly Association attempting to defend the convention of British non-intervention in Stormont’s affairs. Details of this anti-unionist campaign in Britain can be traced in the pages of the Irish Democrat. It is an aspect of the background to the northern civil rights movement and the events it gave rise to that has hitherto been neglected by historians of the period. THOUGH HIS work was in Britain, there is a good case for regarding Desmond Greaves as the intellectual progenitor of the civil rights movement of the l960s. For it was he who pioneered the idea of a civil rights campaign as the way to undermine Ulster unionism. Moreover, as suggested above, the successes of that movement could not have taken place without the changed political climate within Britain itself which Greaves and the Connolly Association’s work had substantially contributed to. Alhough Greaves held strongly that movements in Britain should not organise in Ireland, north or south, and that movements in Ireland should not organise or interfere in Britain, he had considerable personal influence on some of those associated with the foundation of the civil rights movement. It was in response to a suggestion from him that Betty Sinclair, secretary of the Belfast Trades Council, and Billy McCullough its chairman, proposed that the Trades Council hold an important civil rights conference in Belfast on 8 May l965, at which the launching of a campaign for civil rights was discussed, with the republicans for the first time putting their grievances to the Labour men. Greaves always believed that the key to solving the Irish problem was in Britain, where British government policy was primarily formed, rather than in Ireland. When Ulster unionism was squeezed and divided between, on the one side, pressure from London for reform and on the other the pressure of the local civil rights movement, Greaves wrote to prime minister Wilson on behalf of the Connolly Asociation in July l968, advancing the conception of a Bill of Rights at Westminster as the progressive way forward. This advocated a legislative straitjacket being imposed by the Westminster parliament on the subordinate Stormont assembly, which would at once outlaw discriminatory practices – thus guaranteeing civil rights and freedoms for the Northern nationalist population and removing the rational basis of the unionism of a lot of unionists – while at the same time permitting, and preferably encouraging, the devolved administration in the north to develop closer relations with the south. He saw such a constitutional initiative as the best way of enabling nationalists to take advantage of the divisions within unionism, encouraging an alliance in a reformed Stormont between nationalists and liberal unionists, isolating the unionist right and opening up a way in time to peaceful reunification with Dublin. This conception prefigured in significant ways the Good Friday Agreement of nearly 30 years later. The Bill of Rights demand was taken up by the Northern Ireland Civil Rights Association in Belfast. In September l97l, as a result of the Connolly Association’s lobbying, it became the policy of the Trades Union Congress and thus of the entire British trade union movement. But the Labour government was by then out of office and Harold Wilson had thrown away his opportunity to make a constructive contribution to solving the Irish problem. Four months before, in May l97l, following discussions with Arthur Latham MP (7), Lord Brockway (8) and Geoffrey Bing (9), Greaves personally drafted a Bill of Rights in suitable parliamentary form, which was published by HM Stationery Office. This was proposed on the same day, 12 May l97l, by Latham in the Commons and by Brockway in the Lords. It seems to have been the first time in modern British parliamentary history that a Bill was simultaneously presented in both Houses. In the House of Commons the Tories imposed a three-line whip to refuse the Bill of Rights a first reading. This was granted in the Lords, but the Bill was thrown out on its second reading there in June. The Bill of Rights approach to the northern problem sought to leave the Stormont parliament in existence, with its power to do harm from the nationalist standpoint taken from it and its ability to develop in a progressive direction extended. The alternative course, which Greaves used all his influence to oppose but which eventually prevailed, was to abolish Stormont altogether and impose “direct rule” from London. Greaves saw this step as likely to strengthen the Union rather than weaken it, much as the abolition of the corrupt and discredited College Green Parliament in l800 had strengthened the link with Britain then. The call for “direct rule” from London was first put forward by the young left-wing radicals of the People’s Democracy – who saw the Unionist regime in Belfast rather than its principals in London as the main enemy. It was taken up by the newly formed Provisionals, followed by the SDLP’s John Hume and his colleagues. It swept like wildfire through the British Parliamentary Labour Party. And in due course it was implemented by the Conservative Edward Heath in l972 – as Greaves put it, “like a cat being driven into a dairy”. The experience led Greaves to comment that in politics he had rarely known a policy to be adopted on its intrinsic merits; other considerations almost always seemed to have more sway. Some thirty years later, following several failed attempts to reestablish a devolved assembly in the north, the advantages of “direct rule” appeared more dubious to the interested parties, and maximum devolution of governmental functions to a power-sharing Stormont assembly and executive was accepted by Irish republicans and nationalists as the political way forward to eventual Irish reunification. Greaves regarded the military campaign of the Provisional IRA as mistaken, because it could not achieve the end desired, a united Ireland, in view of the imbalance of forces involved, although he respected the good intentions and dedication of the republicans, and he never criticised them publicly. In the l970s and l980s his political work in Britain was concerned with the effects on the Irish community of such measures as the Prevention of Terrorism Act and with lobbying in labour and trade union circles for the adoption by them of a policy of supporting Irish reunification. In those years he sought to bring cultural and educational activity to the fore in the work of the Connolly Association, organising lecture series on Irish history, weekend summer-schools and the like and contributing to the general growth of interest in Irish studies within the Irish community in Britain, as second-generation Irish immigrants began to explore their historical roots. In the latter years of his life he became increasingly concerned with theoretical issues relating to democracy and the nation state, which he thought were likely to dominate European politics for the coming half- century or longer. Greaves was a strong opponent of the European Common Market from its inception. TheIrish Democrat must have been one of the very first political organs to oppose British and Irish membership of that body. Greaves regarded the European Community, later the European Union, as essentially a reorganisation of West European capitalism, and the Treaty of Rome as the constitution of an embryonic superstate, drawn up in the interests of big business, without the slightest democratic elements. He believed that membership of the EC would in due time make the national question, of which Ireland had centuries-long experience, the main issue of politics for all the countries of western Europe, introducing a whole new ball-game for the participants in the class struggle as they discovered the drawbacks of being ruled by foreigners. He was not optimistic about major political changes occurring in the west “until,” as he put it, “revolution sweeps the Third World”, which he thought likely to occur in the first decades of the 2lst century (10). In l985 he organised a Connolly Association conference on the theme “The Defence of the Nation State”. He regarded the nation state as the locus of democracy, because only within national communities were political minorities willing freely to accept majority rule. He used always say that he looked at politics from the standpoint of “socialist internationalism.” Internationalism, not nationalism, was the primary category: one could only claim to be an internationalist if one stood for the independence and right to self-determination of the different nations into which humanity is divided. He believed that the weakness of the political left, in Ireland and across Europe, was due to its failure to be internationalist in this sense. In Ireland organised labour had left the solution of the national question to the parties of the bourgeoisie and small-bourgeoisie, Fianna Fail and the republicans, and was politically marginalised as a consequence. In England and on the continent he regarded the labour movement as rotten with chauvinism as a result of sharing the imperialistic assumptions of the traditional ruling classes. It was therefore slow to appreciate the loss of democracy entailed by membership of the European Community. THESE WERE the values that inspired Greaves’s work as a historian, for which he is best known in Ireland. He was unusual among historians in having a natural science training in addition to a deep humanistic culture. As a Marxist he did not believe that there could be such a thing as non-partisan history – at least not when the historian is dealing with modern issues touching his own life and times. The important thing, he held, was that the good historian should be conscious of and declare his partisanship. He had a low opinion of academic historians generally for failing to do this and for pretending to an objectivity they in no way possessed. He was concerned that labour history should not become another academic industry, fearing that this would tend to rob the working class of its tradition. He was no enthusiast either for the academicising of “Irish studies”. In the late l940s he began working on a history of the Irish labour movement from a Marxist perspective, but when this became too long decided to present it in two parts, weaving the story around the lives of the socialist James Connolly and the left-republican Liam Mellows. As background to this work he wrote a three-chapter outline history of the development of wage-labour in Ireland, which remains unpublished. He also compiled materials for a life of the Irish left-wing leader Sean Murray, but never embarked on it. In writing The Life and Times of James Connolly, which he undertook in the l950s, he had the great advantage, he used say, of meeting many people who knew Connolly personally. It was such a meeting that enabled him to scotch the widely held belief that Connolly was a Monaghan man and to show instead that he had been born in Edinburgh. He also established that Connolly served a period in the British army as a young man. For Greaves the theoretical importance of his biography lay in showing how the Marxist socialist Connolly came to ally himself in l9l6 with the radical democrats of the Irish Republican Brotherhood(IRB) in a revolt for national political independence, which Connolly regarded as the first stage of freedom (11). Connolly’s participation in l9l6 did not, in Greaves’s view, represent an abandonment of his socialism for nationalism, but was rather an attempt to establish an independent democratic state as the essential prerequisite for socialist advance in Ireland, through providing the freest field of operation for the labour movement. 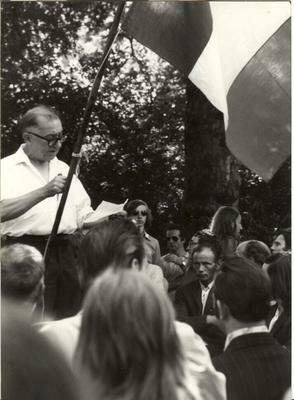 That socialists should seek to give the lead in solving democratic questions – of which national self-determination is one – was always Greaves’s view. He regarded Connolly’s final position on this as similar to his own and as indeed in line with the general views of Marx, Engels and Lenin when they dealt with the national question. Greaves regarded his Liam Mellows and the Irish Revolution, published in l97l, as his most mature and significant work. With its focus on the life of a young radical republican, this book deals with the complex social dynamics and class relations of the revolutionary period l9l6-23, showing how the Irish revolution half succeeded and half failed. We who are heirs to that ambiguous legacy are likely to return again and again to this work whose intellectual riches, as Professor Owen Dudley Edwards remarked (12), are likely to become increasingly appreciated with time. The dialectics of socialism and national independence were transmuted into art in the plays of Sean O’Casey. Greaves’s next book, Sean O’Casey: Politics and Art, is an interpretation of the work of the dramatist through whose eyes much of the left in Britain and Eastern Europe during his lifetime had traditionally tended to view Ireland. O’Casey too had accused Connolly of abandoning socialism for nationalism. In Greaves’s view it was about as sensible to extol O’Casey as a political theoretician as it was to judge Connolly’s politics by his verses. He brought to this study of the interaction of O’Casey’s politics and play-writing a lifetime’s interest in aesthetics. Implicit in the book, he said, is a whole aesthetic theory. In l982, arising from a meeting with Michael Mullen, general secretary of the Irish Transport and General Workers Union, he was commissioned by that union’s Executive to write its history. This was originally meant to be a three-volume work, bringing the story of the union down to the present day. Greaves’s own preferred title for the first volume, dealing with the union’s heroic early period, was “The Age of Giants.” Perhaps the implicit contrast with the present was too much for the union leadership, for when volume l emerged it bore the sober title The Irish Transport and General Workers Union: The Formative Years. In l972 he wrote The Irish Crisis, a study of Britain’s relations with the north of Ireland, the background to the civil rights movement there and the evolution of British policy on Ireland in the early l970s. This book was translated into Russian, Hungarian and Italian. SCIENTIST, HISTORIAN, poet, musician, political organiser, orator, journalist, wit, excellent cook and dedicated gardener, Desmond Greaves was an extraordinary man. His genius confidently spanned C.P. Snow’s “two cultures”. Although without obvious vanity and a caustic subverter of cant and humbug, he did not pretend to false modesty. “I don’t suppose I have a really profound knowledge of any subject,” he once said, “except perhaps Irish history and affairs; but I think I have a wider knowledge of more things than anyone I have met.” As evidenced by the range of his writing and ideas, it does not seem an exaggerated claim. Although he could be savage in private judgement, Greaves was alway polite in public controversy, believing in the principle of the strong hand in a velvet glove and seeking to understand the valid points in his opponent’s arguments. Though sometimes dubbed a “stalinist” by political enemies, one could scarcely meet a less dogmatic person or a mind more open to alternative explanations of events. He was always anxious to encourage the talent of others, especially women and young people. While in private he often deplored what he used call “the ham-handedness” of the Russians and expressed himself as “continually amazed at the extraordinary incompetence of the left”, he refused to criticise the Soviet Union publicly, considering that to do so was to align oneself with the most reactionary forces in the capitalist world of his time. He welcomed Gorbachev’s advent to the leadership of the Soviet Union and his early foreign policy initiatives, but in one of his workbooks for 1987, the year before he died, he has the prescient note: “Gorbachev – going too far to the right?” He did not live to see the collapse of the USSR, but almost certainly he would not have been surprised that that was contributed to, and accompanied by, an explosion of nationality problems. Greaves’s attitude to socialism was based on his appreciation of the values of community and good neighbourliness as the basis of a civilised society. These values, which he regarded as in principle best protected by national states organised along socialist lines, he saw as under fundamental attack from contemporary transnational monopoly capital, with its all-pervasive cult of individualism and consumerism, and its political patrons. Perhaps because of his scientific background, Greaves was an ecologist before ecology became fashionable. He was an early critic of the cult of an economic growth that ignored social costs. “Balance is what is needed, not growth,” he used say of the industrial countries. “I do not fear death,” he used say, “although I can imagine fearing dying.” He considered that the best death was a sudden one, which came in the middle of the work one wished to do. This wish was granted, for he was struck down, on 23 August l988, by a sudden heart attack, following a lifetime of good health, as he sat in the buffet-car of the train bringing him back to Liverpool from Glasgow, where he had gone to speak at a Connolly Association branch meeting the night before. His body was taken off the train at Preston. The funeral took place at Anfield crematorium, Liverpool, and his ashes are buried in Bebington cemetery, Birkenhead, near the corner to the left of the main entrance to the cemetery. In his will he left his estate to be used for political purposes, at the discretion of his literary executor. IT WAS Desmond Greaves’s wish that his literary remains should be eventually deposited in the National Library of Ireland at the discretion of his estate. The most important of these is his Journal, a political and personal record which he kept from his youth, which extends to several thousand pages. There are volumes for several years in the l930s, l940s and l950s, as well as a virtual continuous daily record covering the thirty years prior to his death. This is obviously an important source for a biographer, as well as being a mine of information for researchers on the political life of the Irish community in Britain and the left-wing of the British and Irish labour movements from the 1930s to the 1980s. It contains a record of numerous interviews, sometimes with reconstructed conversations, with people in the Irish national and labour movements whom Greaves met in the course of his historical researches. Secondly is a 150-page comic epic in iambic pentameter, an unfinished verse novel, Elephants Against Rome, which he was working on at his death. Fictional in form but autobiographical in inspiration, this is complete in itself and comprises four of the traditional twelve books of an epic. It appears to be an original contribution to English literature and was published posthumously in 1999. Thirdly come the notebooks, research materials and correspondence relating to Greaves’s work on Connolly, Mellows, O’Casey, the ITGWU history, Sean Murray and other subjects, all carefully catalogued and indexed, which should be helpful to researchers on these topics once they learn to read Greaves’s rather difficult handwriting. Fourthly is the three-chapter outline history of wage-labour in Ireland mentioned above. Fifthly is a collection of several hundred letters to political and literary acquaintances over half a century which he kept copies of or which others kept, as well as various letters sent to him. Sixthly, although strictly speaking not part of his estate proper, is a collection of Desmond Greaves’s Table-Talk – interesting and insightful comments on events and things, amounting to 200 or so typed pages, noted down unbeknownst to him by various friends in the thirty years prior to his death. THE LARGEST volume of Desmond Greaves’s writing is in the monthly Irish Democrat, which he edited continuously for forty years, apart from occasional issues brought out by others when he went on holiday. He invariably wrote sections of the paper himself – sometimes indeed writing most of it – building up over time a huge mass of journalism, ranging from humorous squibs, news stories, pieces of commentary and book reviews to lengthy theoretical articles. Some of these items are of a longer-term interest and may bear replication. The bibliography below is as comprehensive as possible at the time of writing so far as books and pamphlets are concerned. Desmond Greaves also wrote regularly throughout his life for the left-wing and radical press in Britain, as well as for a variety of publications in other countries, ranging from The Capuchin Annual toScience and Society. The articles listed under (4) below are some of the more interesting pieces that he wrote; but there are many other items, the great majority contributed to newspapers, that are not listed. l) Thomas Alfred Jackson, 1879-1955; writer, lecturer and political activist; member of the Socialist Labour Party and founder member of the Communist Party of Great Britain in 1920; author of Ireland Her Own, Dialectics, Charles Dickens, Trials of British Freedom, Solo Trumpet etc. ; see the lengthy biographical entry in J.Bellamy and J.Saville, Dictionary of Labour Biography, Vol. 4. 2) Rajani Palme Dutt, 1896-1974; editor of Labour Monthly from 1921; executive member of the Communist Party of Great Britain 1922-1965; author of Fascism and Social Revolution, India Today, The Crisis of Britain and the British Empire, The International, Problems of Contemporary History etc. 6) Academic historians, often remote from practical affairs, tend to forget the work-burden and immediate concerns of such editors and later, as in James Connolly’s case, ignore such contexts when offering criticism of a particular text or drawing some academic conclusion from minor contradictions in argument or journalistic detail. l0) These and other references to Desmond Greaves’s conversation are from his “Table-Talk”, which will be deposited in due course with his papers in the National Library of Ireland. Anthony Coughlan is Desmond Greaves’s literary executor and knew Greaves well from 1958 to 1988. He is Senior Lecturer Emeritus in Social Policy at Trinity College Dublin. This is an updated and slightly revised version of the obituary essay commissioned and published by the Irish Labour History Society, Dublin, in 1990.